Occasionally, a band or artist will have a single which becomes a fairly good-sized hit but which becomes a forgotten song because of other songs the band/artist has released which completely overshadow the single in question. Even if a band is known for only a few songs, the huge hits can almost drive the songs that were just big from people’s minds. That appears to be the case for the late 90s band Savage Garden. Per its website, Savage Garden came about when Darren Hayes and Daniel Jones “joined forces to create what would become Australia’s biggest and most successful musical duo”. Specifically, the duo’s story began when Mr. Hayes was the only person to respond to Mr. Jones’s ad looking for a singer for a cover band called Red Edge. Eventually, the two of them moved on to form their own group and move away from covers to original songs. Originally called Crush, the duo borrowed a phrase from Anne Rice’s The Vampire Lestat to get the name with which most people are familiar. The duo’s first, eponymous, album, was an immediate success, buoyed by the strong performances of at least two tracks. The first single from the first album was “I Want You”; the single really rocketed the group into the American consciousness with its catchy, if rapid, lyrics which, at least to me, brought to mind the early 1970s Reunion hit “Like Is a Rock (But the Radio Rolled Me)”. “I Want You”, taking full advantage of an early 90s change in methodology in determining the chart, debuted all the way up at #31 for the week ending March 1, 1997 (chart | magazine) and worked its way up to #4 for the week ending May 10 (chart | magazine). It stayed on the Hot 100 for a healthy 33 weeks and finished 1997 as the #22 single. Breaking into the music scene with a single like that was a good start for Savage Garden; fairly quickly, they built upon that foundation with two huge #1 songs: “Truly Madly Deeply”, which spent 52 weeks on the Hot 100, and “I Knew I Loved You”, which was Billboard’s #1 Adult Contemporary single for the entire decade 2000-2009 (source). It’s kinda easy to see how, despite the initial success of “I Want You”, Savage Garden is remembered more for those two hits. In the years since, Mr. Hayes has gone on to a solo career, while Mr. Jones has his own production company. Neither has any plans for the reformation of Savage Garden. For such a short-lived band, Savage Garden had a tremendous amount of success, with some songs still getting airplay on American radio today. It would be nice if their very first hit received some more as well. 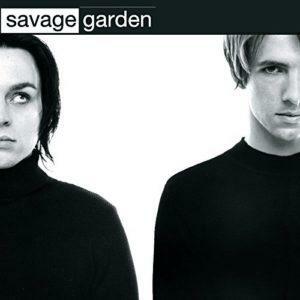 It would be nice if Savage Garden’s first hit received more radio airplay today.